The Program in Polymers and Soft Matter (PPSM) [formerly PPST] at MIT is an interdisciplinary program offering graduate education in the field of polymer science and engineering. The Program’s goals are to provide educational opportunities for students who wish to focus their graduate education within the broad field of polymers and to foster a spirit of community and collaboration among the large group of students, post-docs, faculty, and visitors involved in polymer-related activities at MIT. PPSM provides a core curriculum in polymer studies and a doctoral qualifying examination that is accepted in place of departmental exams by five participating departments at MIT (Biological Engineering, Chemistry, Chemical Engineering, Materials Science and Engineering and Mechanical Engineering). 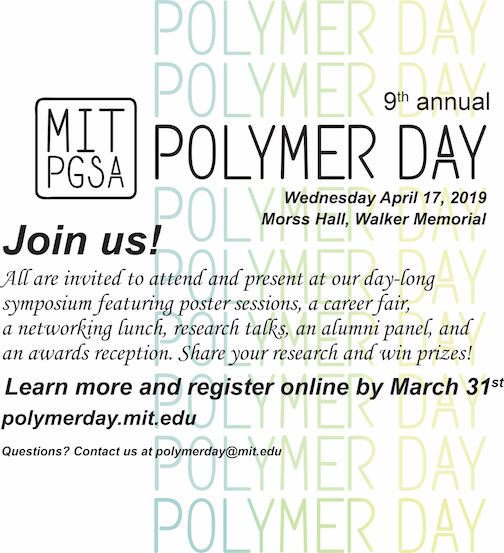 PPSM produces a popular weekly research seminar, coordinates the schedules of visitors to MIT from the worldwide community of polymer specialists in industry, academia and government, and arranges special events and research poster competitions for the MIT polymer community. The PPSM Graduate Student Association (PGSA) organizes social events, helps to maintain the Program’s website and provides an important channel of communication between PPSM students and faculty.